Two years after promising an "unprecedented partnership" with Nintendo, EA has nothing in the works for the Wii U. 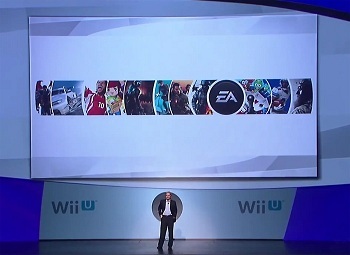 At E3 2011, EA CEO John Riccitiello stood on stage and proclaimed, in the wake of the Wii U's unveiling, that EA and Nintendo would be enjoying an "unprecedented partnership" in the years to come. It left many gamers wondering what the publisher could be bringing to Nintendo's new console to merit a public proclamation. The answer, it would seem, is "not much." Speaking to Kotaku, EA spokesperson Jeff Brown confirmed that the publisher currently has "no games in development for the Wii U." This comes following a spate of similar bad news for Nintendo on the third party front. Just Cause 2 developer Avalanche Studios recently said that its Wii U development kits were "collecting dust." Likewise, Battlefied-makers and EA subsidiary DICE recently reported that its Frostbite 3 engine wasn't running well on the Wii U. The issues with Frosbite 3 may have been a foreshadowing of things to come, as EA will likely be using the engine as the foundation of many of its future titles. While perhaps not completely unexpected, EA's dwindling support could pose a significant problem for the success of the Wii U. EA owns and holds the rights to a number of prominent franchises which, as of recently, includes Star Wars. If EA continues ignoring the Wii U in the future, it could keep that franchise off the console for years to come. As for the "unprecedented partnership" EA promised in 2011? According to Brown the publisher's early run of games for the console, which included Mass Effect 3, Need for Speed Most Wanted, Madden and FIFA, was the company keeping that promise.